Companies can use many methods to protect their intellectual property rights including non-disclosure agreements, patents, trademarks and copyright. However these all rely on the law to enforce them which can be ineffective and expensive. If you want to ensure secure distribution of digital documents and control over use, you need to apply encryption to prevent unauthorized access and DRM to enforce how documents can be used. Control use – stop printing, copying, editing, etc. Intellectual Property Rights, or IPR, for short, is a ‘catch-all’ phrase for all manner of things that are not tangible physical goods, yet over which you may be granted economic rights – rights that mean being paid if people use the results of your intellectual efforts, whether they make a profit from using them or not. What kinds of things does this cover? Well, it’s a big list. Intellectual property rights include patents, trademarks, computer software, books, plays, sound recordings, films, broadcast works, databases, photographs, paintings, statues, building designs, just to name a few. You need to be careful to understand that intellectual property rights only exist when legislation grants you an economic right that you can enforce. There are many other things where you cannot establish a legal control. These include such things as formulations (the specific ingredients of a Chanel perfume, or the herbs to be added to make the liqueur Chartreuse) or how to select the best customers for your product, or your product development plans for the next six months. These are trade secrets, and whilst you will likely need all the technology controls appropriate to Intellectual Property Rights, through digital rights management, you will have little chance of using Intellectual Property Rights law to protect your information. Read this article on trade secrets published in 1991 for guidance on how you might choose the protection relevant to your circumstances. Perhaps one of the more interesting things is that in many countries it is not always necessary to register copyright ownership (which applies to this article, for instance), although for many printed works it is considered prudent to add a copyright mark such as © followed by the identification of the owner and the date. Copyright comes into existence with the act of creation/recording. However, we should mention that in some countries it may be necessary to register your copyright, or it may, as in, say the USA, helpful as a means of proving that you were indeed the first to publish. For otherwise, as art imitates nature (Marcus Aurelius) others can imitate you (and can not be sued for that sin). On some occasions, intellectual property rights may be lost if you do not enforce them. An example in the USA is that if you have a trademark, and do not take action if someone misuses it then it may become diluted and lost. And one of the great problems with protecting copyright is that (because) it costs nothing to gain, so it may cost a lot to defend. By comparison a patent, an intellectual property right that can only be gained as a result of paying fees to governments (and likely to lawyers) requires a public disclosure of what you are patenting, so that anyone and everyone can see it. But the government stamp of approval, because you have paid fees, makes it easier to defend your rights. The same is true of trademarks. As an intellectual property right they are registered with governments, and that gives you the ability to prevent other people from using the right that you registered. (Please note that in Common Law countries such as the UK and USA it may be sufficient to be able to prove that you have been using a trademark for the genuine purpose of trade to gain the right to prevent others from being able to use it, but it is much easier if it is registered.) But you have to enforce your rights or you can lose them. One thing to be aware of is that some intellectual property rights do not give you absolute rights to control information. Patents, as we mentioned, require you to make the content of the patent available to anyone, and they are free to copy the information in the patent and do what they want with it, except build something covered by the patent. Patents stop being valid after a period of time, sometimes up to 25 years from filing. Copyright has other differences. People have the right to quote small amounts of the work for the purposes of analysis, criticism and so on. Also they make a parody of the work. And they may use it for private study. Copyright lasts longer than patent, being up to 100 years (films) or 85 years after the death of the last author (books) depending on the country you are in. So when you are dealing with intellectual property rights, you need to know what kind of intellectual property you are dealing with, or if it is actually a trade secret, before deciding how best it is to be protected and how best you will defend your rights if someone decides to try and misuse them. 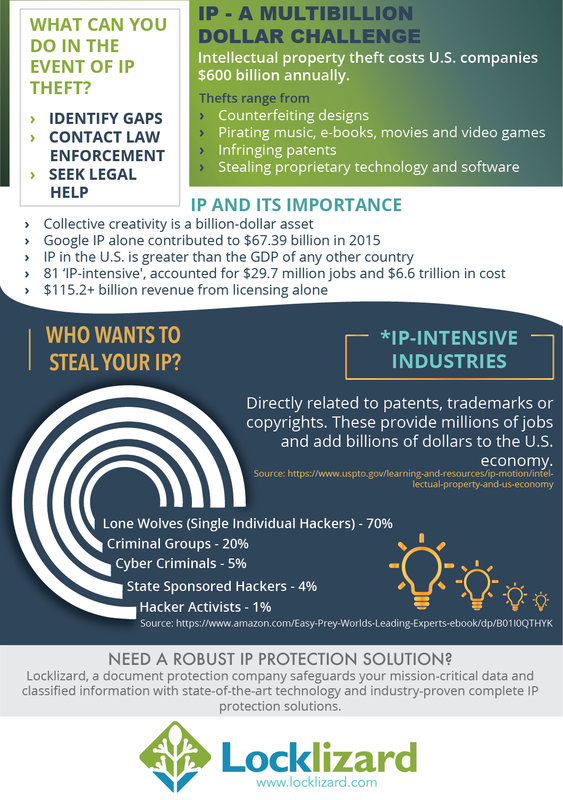 Why Locklizard for IPR Protection? Locklizard takes your document protection seriously. We provide total IPR protection using US Gov strength AES 256 bit encryption and public key technology to ensure your confidential, secret, and revenue generating documents remain protected no matter where they reside. Our DRM PDF Security products enable you to share documents securely without insecure passwords or plug-ins, and enforce access, location, expiry, and usage controls. Unlike Adobe Permissions which can be easily removed, our DRM controls persistently protect your PDF files and enable you to revoke documents at any time regardless of where they are. No keys are exposed to users or interfaces and documents are only ever decrypted in memory – see our DRM technology. Our easy to use adminsitration system provides simple user and document management and unlike passwords, keys are transparently and securely managed for you. See our customer testimonials or read our case studies to see why thousands of organizations use Locklizard PDF security to securely protect, share, and sell their IPR. Download intellectual property protection software that protects documents published in PDF format from unauthorized use and misuse. Protect, control, and analyze confidential, sensitive, or revenue-generating documents on any device, in any location for total IPR protection.